1. The Philippine High School for the Arts (PHSA) Annual Nationwide Search for Young Arts Scholars (ANSYAS) is now accepting applications for Full Special Secondary (K to 12) Scholarship for School Year 2018-2019.
b. ensure a continuing source of artists of excellence and leaders in the preservation, conservation and promotion of the Filipino artistic and cultural traditions. f. One-page resume citing accomplishment in the art field of their respective interests. 4. 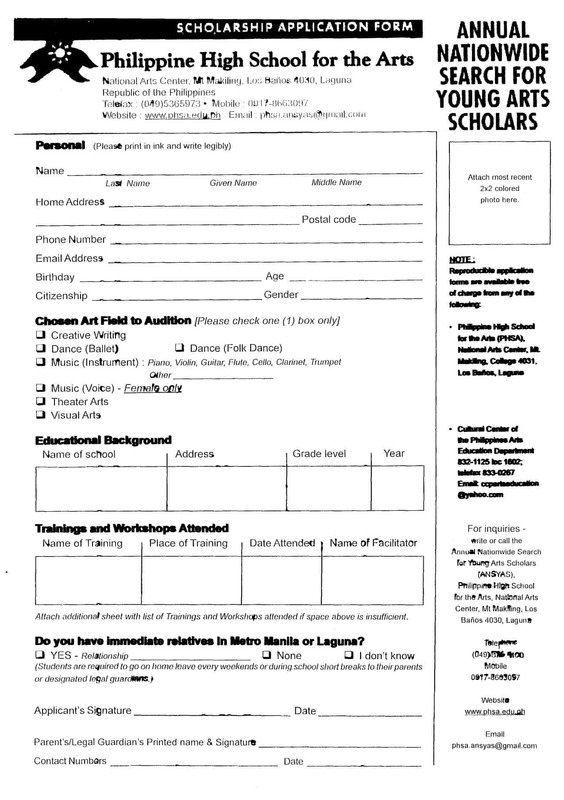 The successful applicants will be awarded full scholarship which includes free tuition fee, free board and lodging (with weekend home leave with parents or a designated legal guardian), classes with master teachers, monthly stipend, free tickets to shows, events and performances at the Cultural Center of the Philippines, opportunity to get training, to meet and interact with outstanding world class artists, visiting foreign artists, and a chance to represent the country and the school in international festivals, competitions and exchange programs. The scholarship grant is renewable every year for four to six consecutive school years upon satisfaction of academic and nonacademic requirements. 5. Interested applicants may directly send their accomplished application forms and other requirements by mail, email, or by personally submitting them to the Annual Nationwide Search for Young Arts Scholars (ANSYAS) Committee, Philippine High School for the Arts (PHSA), National Center, Mt. Makiling, Los Banos 4030, Laguna. The PHSA Scholarship Form is enclosed. 7. Applicants will be notified by phone whether or not they are qualified to proceed to the live auditions. 8. For more information, all concerned may contact Ms. Shirley A. de Quiros, Coordinator, Annual Nationwide Search for Young Arts Scholars (ANSYAS), Philippine High School for the Arts (PHSA) ANSYAS Office at telephone no. (049) 576-4100; mobile phone no. 0917-866-3097 or through email address: [email protected] or visit website address: www.phsa.edu.ph. 9. Immediate dissemination of this Memorandum is desired.